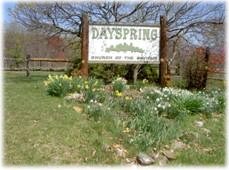 Dayspring Farm is a retreat center owned by Seekers and the other faith communities who are part of Church of the Saviour. It’s a place of reflection and renewal for many folks, including those of us in Seekers Church. We gather there for our semi-annual silent retreats; for Easter sunrise and other special services; and to participate in workshops and events at Wellspring Center. 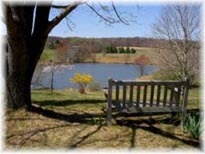 The land is an oasis of quiet, a prayerful place close to Washington, D.C. 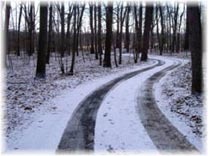 When I am there I always find some small, delightful image like this winter view of the road to the silent retreat center, an image that draws me more consciously into God’s amazing diversity. 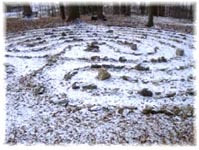 This labyrinth, tucked into the crest of a wooded hill, invites me to slow down, to rest on the bench placed in memory of Linda Strand, who was a member of Seekers Church. Jenny’s Tree was planted in 1977 by Doug and Joan Dodge, in memory of their infant daughter. It shades a bench above the Lake of the Saints. The Wellspring Conference Center at Dayspring provides a welcoming setting for meetings and retreats.